Have you ever heard anyone say that there is nothing to do in Haywood County during the winter months? Well, at least in my opinion, they are wrong! There is so much to do in the coming weeks that it is going to take at least two blog posts this week to cover it all! I’ve posted some events today. I was trying to get everything in one post but it was getting way too long – I didn’t even want to finish it! So look out tomorrow for another post. And as always, if you have events not listed, send me a message or comment on the blog with the details. Thanks and have a great day! Smoky Mountain Sk8way has skating, wall climbing and fun and games galore! There regular schedule is Wednesday Night 6-9pm; Fridays 6-11pm; Saturday day session 11-6pm and night session 6-11pm; Sunday 1-6pm. They are always open for school or church events as long as there are 30 people or more scheduled to attend. You can call 828-246-9124 for more information. Ms. Arty Pants has events and activities just for you! They do ask that you call or text to register so that materials can be available for your art experience. January 9 Open Paint After school 330 to 530; January 10 Open Paint; January 12 Midnight Paint 10p to 12a; January 15 Toddler Tuesday; January 16 Morning Open Paint 9a to 11a and After School Open Paint 330 to 530; January 17 Open Paint 7p to 9p. The number to call or text to register or for more details is 828-400-6232. Smoky Mountain Cinema has announced that “Les Miserables”, “Lincoln”, and “The Guilt Trip” will all start showing on Friday, January 11th! Show times and the complete lineup can be found by calling 828-452-9091. The Canton Armory will be the site for the an indoor “Pickin’ in the Park”! This event is scheduled to be held twice monthly until it can once again be held outside. This session will have the Lisa Price Band and the Dixie Darlings and the Mountain Traditions Square Dance teams. Call Carroll Nelson at 828-648-2287. The event is free and open to the public. The Pisgah Promenade Square Dance Club will hold a snowflake dance from 645 until 845 pm at the Old Armory Recreation Center on Boundary Street in Waynesville. Inspired Art Ministry First Baptist Church sessions start January 14. Classes will be offered in: Photography with Ed Kelley; Children’s Art with Jo Ridge Kelley; Adult drawing and painting with Char Avrunin. Call 828-456-9197 for more information. Haywood County Chamber of Commerce will host its annual elected officials reception on January 15 beginning at 530pm at Laurel Ridge Country Club. There is a $10 registration fee. Call 828-456-3021 for details. The Haywood County Arts Council will host an exhibition entitled Fire and Ice: Pottery, Glass and Metalwork”. Gallery 86 on North Main Street in Waynesville is open 10am until 5pm Monday through Saturday. There will be an artist reception on Friday January 25 from 6-8pm. You can find more details at www.haywoodarts.org or on their Facebook page. MLK Holiday Weekend will begin with a pride march that starts at Harris Chapel AME Zion Church on Prospect Street in Canton. The march will be followed by the showing of the movie “Skin” at the Colonial Theatre. The movie will be shown for free at 1pm and again at 6pm. Call 828-646-0125 for more details. MLK Holiday Commemorative Service will be held at 3pm at the Church of God of Prophecy in Canton. Call 828-646-0125 for more details. MLK Holiday Prayer Breakfast will be held at Lambuth Inn at Lake Junaluska Assembly. Breakfast begins at 8am. Tickets are available for sale at the Bethea Welcome Center. Call 828-646-0125 for more details. Altrusa Annual Soup and Cornbread. The funds raised from this event go to scholarships for Haywood county students. Each year Altrusa awards about $8000 in scholarships and all these monies come from the sales at the Soup and Cornbread. The event is Tuesday January 22nd. Tickets are $8.00. Visit www.waynesvillealtrusa.org for more information. Haywood County Chamber of Commerce Young Professionals will be hosting their first professional development event of the new year on January 24 at 8am at Bethea Welcome Center. Contact the Chamber or join them on Facebook for more details. Andrew Sanderbeck of People Connect Institute will be the guest speaker. The Blue Ridge Bridal Event will be held at Lake Junaluska Assembly. The event is being presented by the Mountaineer Publishing Company. Vendor spaces are still available by calling 828-452-0661 x125 or x129. What if you are afraid of the number 13? How do you cope with next year’s date????? It’s hard to believe that 2012 is coming to a close. So much has happened in the last twelve months! For today, I want to post the New Year’s Eve events that I know about so far. If you have more, please let me know! I’m guessing that there will be more to add tomorrow or Monday so come back to check it out! There are lots of options in Haywood County and the surrounding area for adults to celebrate the ringing in of the NEW YEAR and at least two for the teens and kids in your life. Haywood Arts Regional Theatre will have their annual event from 6 until 9 pm at the theatre. It is a potluck event so bring your favorite dish to share. The event is open to anyone who loves HART theatre. Old Stone Inn will be hosting a special dinner with an amazing menu “cooked up” by Chef Terry. Call 828-456-3333 to make your reservations. Sid’s On Main in Canton will be hosting a special dinner with live music from Bobby G to ring in the new year. Call 828-492-0618 to make your reservations for the evening. Maggie Valley Club will be hosting an event with live music from 45 Cherry and a live ball drop and champagne toast. Call 828-926-4831 for reservations. The Classic Wineseller and Angelino’s Piattino Ristorante in Waynesville will have live jazz and dinner. Call 828-452-6000 for reservations. The price increases at the door so planning in advance is encouraged. Balsam Mountain Preserve will be hosting an event in the Boarding House beginning at 8pm and continuing until 1am. There will be live music with Terry Lee and the G.T.’s along with an awesome dinner menu, desserts and cigars. There will be a midnight toast and door prizes. Call for reservations at 828-631-1000. Smoky Mountain Sk8way will have an all-night skate beginning at 6pm. Lots of activities and fun for the entire family. There will be party favors and food. An open climbing wall and pool table will be available. There are two end times: 10:30pm for those who want to party elsewhere (or just can’t make it all night) and 6am. The doors close at 10:30 so no one goes outside without their parent. Check out their Facebook page for more details. The Factory in Franklin will host family activities until 2am. From a little farther away but still a moving event, the Great Smoky Mountain Railroad will be hosting an event for railroad enthusiasts. The train departs at 9pm from Bryson City. Call for more details or check out their Facebook page. Altrusa Annual Soup and Cornbread. The funds raised from this event go to scholarships for Haywood county students. Each year Altrusa awards about $8000 in scholarships and all these monies come from the sales at the Soup and Cornbread. The event is Tuesday January 22nd. Tickets are $8.00. I hope that this finds you well today! I just wanted to remind you that Smoky Mountain Jumphouse and Smoky Mountain Sk8way are open today for your school day boredom! And Smoky Mountain Cinema has announced their new listing of movies beginning today with Rise of the Guardians. And don’t forget that you can get food from lots of area restaurants tomorrow if you don’t want to cook! As for me, I still have to stop by the grocery store today for the final little things to finish out the meal! It is Saturday morning. In late November. The busiest retail season of the year. I am at home. I haven’t been at home on a Saturday morning in late November since 2005. I’m excited to hear the sounds of my children playing and laughing and going about their days. I’m glad I could be the one to ride as my oldest drove to a Boy Scout camping trip this morning. I’m sad that I am not on Main Street in Waynesville talking to customers and listening to Christmas music. It is time to break out the holiday tunes! Last year, I had 41 different renditions of Silent Night and 39 of The Christmas Song (chestnuts roasting….) on my music system at Fun Things Etc. I’m trying to figure out a way to rig this up at home so I can torture my kids! I want to let you know about some things coming up in the next week or so in our community. Lenoir Creek Beef and Bakery is opening in Canton! Lenoir Creek Beef has sold grass-fed beef at the local farmer’s markets for awhile. They now have a full-time retail location. I’ve heard great things about the bakery as well as the beef so be supportive and check out what they have to offer! Smoky Mountain Sk8way is have a Quirky Turkey Skating event this evening. In case you haven’t been following them, there is now a climbing wall and some other activities at the center in addition to skating. 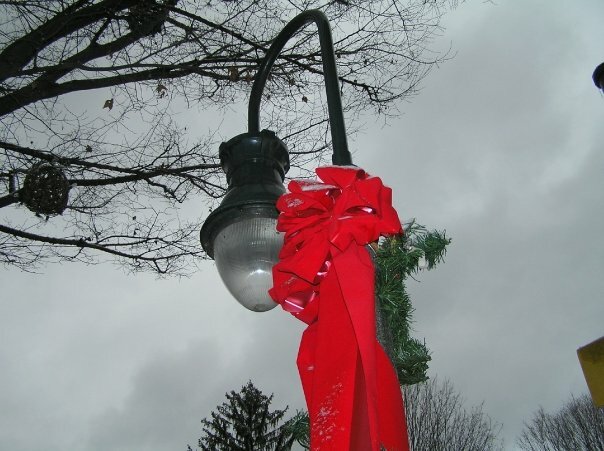 Sunday November 18 has one of my favorite traditions of the holiday season — Downtown Waynesville will have the Holiday Open House. The stores are packed with merchandise for browsing; the windows are decorated; the street lights are decked out and Santa is roaming the streets! I love this day! I hope that I’ll see you there while I take my kids to browse and check out all the cool displays. Olde Brick House, Twigs and Leaves, Christmas is Everyday, Home Tech (the Kitchen Shop), Mast General Store and so many more shops and galleries will be open and have surprises and goodies for us. On Monday November 19 Hazelwood Soap Company will be hosting Sip and Shop in the evening. There will be some great company and some great deals so you should make a trip to Hazelwood to see them! On Friday November 23 and Saturday November 24, I will miss tie-dye days but the Tool Shed is having a special Tote-ally Vera Offer that will be great to check out. Plus all of the shops in Canton, Waynesville and Hazelwood will be open and waiting for you! Check out the galleries in Frog Level and the specialty shops in Clyde as well as visiting with your favorite merchants all over town! Plus if you are an American Express customer and use your card in a small business on Saturday, you’ll get a reward! On Sunday November 25, The Tool Shed will host their annual open house. So many things coming up! So much energy and excitement. I do love this time of year. I hope you do too! Blah blah blog…..What do you think?